About our 7 seats car – rent 7 seater minivan Dubai – Sharjah with driver rental program: With room for 7 passengers and 2 pieces of luggage, this air-conditioned passenger van is perfect for larger groups or families transportation. Toyota Previa 7 seats or similar vehicle. A 7 seater passenger vehicle is the best small van or car and the great choice if you need to accommodate for max 7 people with few small luggage. All people carriers vehicles are hired with a professional driver. Apart from 7 seats car – rent 7 seater minivan Dubai – Sharjah with driver you can hire our other bus rental services by clicking here. 7 seats car – rent 7 seater minivan Dubai – Sharjah with driver is the right fleet for when you need to get job done of fast track. 7 seats car or 7 seater Previa minivan is one of the hardest working vehicle in the ground transport industry, many of our valued customers have have been choosing Previa Car for their small family transportation, events transport, hotel transfer or Dubai city tour , Abu Dhabi tour. We offer affordable rates on 7 seats car – rent 7 seater minivan Dubai – Sharjah with driver on daily basis hiring. The 7 Seats car or van usually chosen when some one want to get activity done rapidly and on fast track, It gets passengers from one destination to another very fast in comfortable way and efficiently. 7 seater car or 7 seats minivans are mostly used for family transport in Dubai, Sharjah, airport transfers, functions, staff shuttles and transportation of wedding guests to and from venues and to their destination. 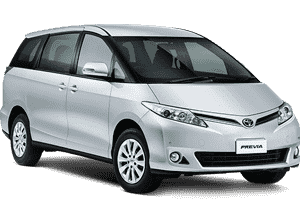 The Previa 7 Seats van’s model is great design with luxurious inside and suitable for any job in line to number of passengers, it pays that renting these fleets in any city of United Arab Emirates is one of the most affordable option. It carry the great balance between complete comfort. Get the best deals from us on 7 seats car – rent 7 seater minivan Dubai – Sharjah with driver on daily basis in our Dubai, Sharjah branches. For further info regarding 7 seats car – rent 7 seater minivan Dubai – Sharjah with driver and quick van rental prices inquiry please click on below links. 7 Passenger, 2 Baggage, 5 Doors, Air Conditioning, Sound System.